Upgrade your Metro Vac N Blo vacuum with this optional 3 ft. hose! The hose features durable, flexible construction. The hose extends the reach of your Metro Vac N Blo when combined with the vacuumï¿½s included 3 ft. hose. Reach under car seats, into trunks, and into all the nooks and crannies of your vehicle with Vac N Blo 3 ft. hose attachment. The Metro Vac N Blo 3 ft. Hose works with the VAC N GO 500 Hand Vac and the Vac N Blo Portable Vacuum. Multiple hoses can be connected. 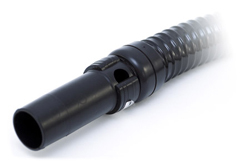 This hose attaches to your vacuumï¿½s existing hose or to the 6 ft extension hose. Every hose has a power control at one end to control the flow of air. Extend your reach with the Vac N Blo 3 Ft. Hose! I bought this Vac and Blow 18 years ago, and considering what it has done in those years, it's an amazing tool. Living in Florida, and in my garage, the old hose was subjected to extremely high heat and humidity. It has cleaned 16 new cars, 3 boats, and countless driveway and garage cleanings.. The old hose lasted all those years, with a bit of help from duct tape ! !